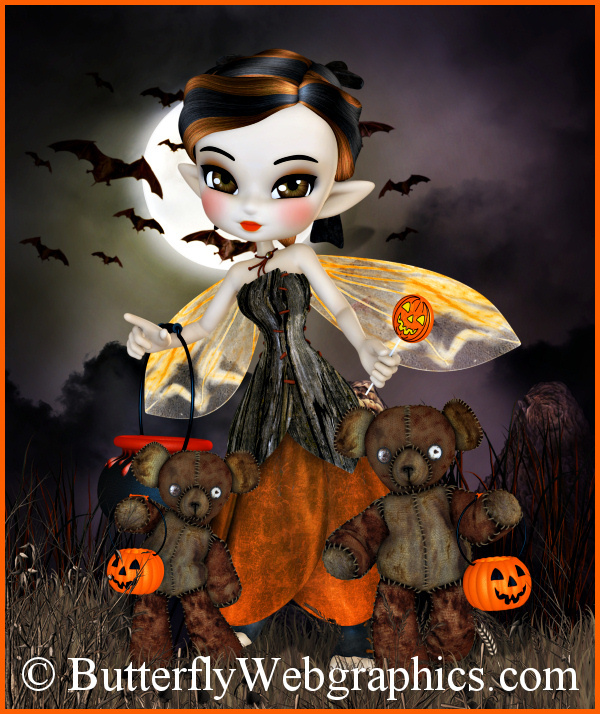 Cute Goth fairy graphics with their spooky Halloween bear. The fairy in the scene above has been greatly reduced. Not all are shown. October fairies in fall colors for Halloween and Harvest designs. This was the first of a series of fairies that I featured each month. This monthly fairy is October Fairy, an adorable little fae that paints the autumn leaves and awakens the spirit of Halloween. Her beloved scary bear accompanies her wherever she goes. She and her bear are ready to trick-or-treat and celebrate Autumn. An African version of each fairy is included. The size of these images varies, but they are approximately 1500 X 2000+ pixels. All are 300 DPI, making them great for print projects. Perfect for all kinds of design projects, including web design, template design, graphic design, t-shirt design, candy wrappers, scrapbook design, print transfers, DIY crafts, card making, embroidery designs, fabric blocks, address labels, business cards, newsletters, stationery, invitations, banners, crafts you print, paper projects, digital stamps, notelets, stickers, note cards, signature tags, and much more. Please read my terms to learn more. This package contains one zip file, which is approximately 53 MB.